The Historical Society of Pennsylvania is one of the most complete and professional genealogy centers in the nation—and the largest in the Mid-Atlantic region. HSP collects genealogical materials from Pennsylvania and every other state east of the Mississippi River. Its collections also cover pre-migration from Europe, the genealogical “stepping stones” across the Caribbean, and out-migration to Canada. The following is a small sampling of collections and sources available at HSP. Please refer to our online catalog for information about our books, images, journals, manuscripts, maps, and other items in our collection. You can also contact a Reference Librarian for further assistance. HSP holds many diaries, journals, family trees, and related family documents and manuscripts that contribute to the understanding of many family histories. Collections of particular interest might be those of Pennsylvania’s founding families, including Penn, Logan, Norris, Pemberton, Drinker, Shippen, Cadwalader, Chew, Biddle and Powel. You can search our Discover online catalog for family names, town or township names, or other locations and landmarks that may provide insights into your family history. Descriptions of all manuscript collections are available in the online catalog, and many collections have finding aids online or at HSP that provide more information. Visitors to HSP's library should also look for names and other terms of interest in our manuscripts card catalog, known as PC1 (and not available online), which serves as a name index for many manuscript items. HSP holds microform copies of wills and deeds for many Pennsylvania, New Jersey, and Delaware counties. Generally indexed and often abstracted—especially helpful if you're looking for family connections—these records are typically available for the period from the first year of record through the 19th century. HSP also has indexes to letters of administration for many counties, as well as Orphans Court records for Philadelphia and other counties. For a complete listing of our holdings by county, please search our online catalog for the subject-heading “probate records” and the name of the specific county in which you're interested (e.g. Bucks County Probate Records). However, estate inventories and administrations for Philadelphia County are not available at HSP. Please ask a Reference Librarian for further information. You may also be interested in consulting the Genealogical Society of Pennsylvania's online resource guides, which summarize where to find various counties' wills, deeds, and other records. Some probate records are now available online. HSP offers visitors to our library free access to AncestryInstitution.com; FamilySearch.org is free for all users. See an HSP Reference Librarian for further assistance using these resources in the library. Originally compiled by members of the Genealogical Society of Pennsylvania (GSP), HSP’s collection of scrapbooks and family history folders contain original research pertaining to literally thousands of family lines. The family history folders may contain a single sheet of paper or hundreds of pages of research and correspondence. Many items are listed in our Discover online catalog; other items are indexed solely in GSP's Manuscript Archives Surname Index. It is recommended to search both resources for a surname that interests you. Available in both original and microform format, tax records for Philadelphia and other tri-state localities can reveal information on family relationships, occupation, residences, and general economic status. Information on specific years and localities may be found in our Discover online catalog. A large number of the records of the region’s many churches, meetings, and synagogues may be found within HSP's collections. Available in original, transcribed, abstracted, and microform format, these records offer invaluable access to information on births, marriages, deaths, burials, and community activities. Information on specific churches and denominations represented in our collections may be found through our Discover online catalog. In addition, HSP partnered with Ancestry.com, the world’s largest online family history resource, to make our collection more accessible to researchers. As part of this partnership, Ancestry.com has digitized more than 7.5 million Pennsylvania vital records from HSP’s collection, including church, cemetery, and undertaker records from every county in the state from 1708 through 1985. All of these records are available online for free for members of HSP, as well as to visitors to HSP’s library and to Ancestry.com subscribers. Pennsylvania began issuing birth and death certificates in 1906. Before that time, some Pennsylvania counties kept birth registers as early as the Civil War, and some counties kept marriage registers even earlier. For example, check out Philadelphia's marriage registers, available on microfilm at HSP. HSP’s collection of birth records includes published compilations covering various time periods, geographical regions, and religious affiliations, including Pennsylvania German Church Records (call # Ref F 160 .G3 P427 1983), Early Pennsylvania Births, 1675-1875 (call # REF F 148 .F5 1947), and Pennsylvania Vital Records from the Pennsylvania Genealogical Magazine and the Pennsylvania Magazine of History and Biography (call # REF F 148 .P48 1983). Search HSP's online catalog using subject headings such as births, birth records, or the name of the specific church or denomination to which a family belonged. Also, search the family surname, town name and county name to see what records may be available. Philadelphia Marriage Records Index and Register, 1860-1916. (Indexes 1860-1885: XR 875:1-6; Registers 1860-1885: XR 875:7-13); NOTE: The Marriage Register after 1885 must be obtained from the Philadelphia Marriage Records Department at City Hall, Room #415. HSP's collection also contains a large number of marriage certificates, which can be located in our manuscripts card catalog (PC-1) under an individual's surname. In addition, a number of newspapers have been indexed for marriage notices, and church records are also an excellent source for information about births and marriages. Search our online catalog by county name to see what birth and marriage records may be available. Some birth and marriage records are now available online. HSP offers visitors to our library free access to AncestryInstitution.com; FamilySearch.org is free for all users. See an HSP Reference Librarian for further assistance using these resources in the library. Death and burial records can be accessed through various published, unpublished and microform sources. In many instances, official records of deaths were not compiled until after the Civil War. However, church records often contain information about deaths or burials in church graveyards. Philadelphia maintained semi-official records of deaths prior to 1860, documented in the Board of Health Cemetery Returns, 1803-1860. For the period after 1860, the Philadelphia Death Register, 1860-1903 is the most comprehensive source for Philadelphia County. Please also see our research guide about Vital Records. Records for dozens of current and past cemeteries in the region are also available at HSP, including Mt. Moriah Cemetery, Laurel Hill Cemetery, Odd Fellows Cemetery, and Greenwood Cemetery. HSP’s collections also include a number of undertakers' records. Most notable are those of the Oliver H. Bair Company, the Andrew J. Bair Company, David H. Bowen and Son, and Kirk & Nice, Inc. HSP partnered with Ancestry.com to digitize the index to the Oliver H. Bair Company records. The index is available online for free for HSP members, as well as to visitors to HSP's library and to Ancestry.com subscribers. Pennsylvania records for deaths occurring after 1906 are maintained by the Pennsylvania Department of Health, Division of Vital Records. These records are now available to the public for deaths that occured at least 50 years ago. Some death and burial records are now available online. 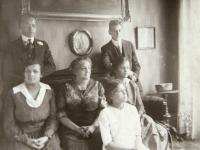 HSP offers visitors to our library free access to AncestryInstitution.com; FamilySearch.org is free for all users. See an HSP Reference Librarian for further assistance using these resources in the library. HSP holds census indexes and films for Pennsylvania from 1790-1900 (and the entire country for 1850). Materials available for additional states vary widely. Please see our guide on Census Records or speak to a Reference Librarian for further assistance. Many census records are now available online. HSP offers visitors to our library free access to AncestryInstitution.com; FamilySearch.org is free for all users. See an HSP Reference Librarian for further assistance using these resources in the library. While HSP does not hold many original passenger or immigration lists, its collections do include an extensive number of indices and published abstracts. Notable among them are Filby’s Passenger and Immigration Lists Index and Philadelphia Naturalization Records, 1789-1880; and Philadelphia Passenger Lists, 1883-1948 [microfilm]. HSP also offers a variety of sources focusing on immigration from particular regions, including series about Germans to America (1840-1897); Italians to America (1880-1905); Migration from the Russian Empire (1875-1891); Pennsylvania German Pioneers (1727-1808); Irish immigration, especially The Famine Immigrants (1846-1851); Norwegian Immigrants to the United States (1825-1850); Emigration from the United Kingdom to America (1870-1880); and more. Note that some published sources are now available online. HSP's online catalog includes links to some of those sources (if available, the link will appear in that item's record in the catalog), or you can try searching in Google.com or another search engine to see what you can find online. Some immigration records are also available online. HSP offers visitors to our library free access to AncestryInstitution.com; FamilySearch.org is free for all users. You may also want to visit EllisIsland.org and Stephen Morse's One-Step Webpages, which include searching tools for Ellis Island and other immigration records. See an HSP Reference Librarian for further assistance using these online resources in the library. HSP's library contains one of the largest collections of published family histories, many of them rarely available elsewhere. In addition, published biographies, personal narratives, church histories, and general county and township histories provide a wealth of genealogical information. Search our online catalog for more information about surnames, towns, counties, organizations, and landmarks that may fill in the gaps in your family history. A number of newspapers have been indexed for obituary and marriage notices. Particularly noteworthy are the indexes to Poulson’s Daily Advertiser (1796-1839); the Philadelphia Public Ledger (1836-1875); the Pennsylvania Inquirer and Daily Courier Marriages and Deaths Index (1834-1854); the Index to Obituaries from the Sunday Dispatch (1868-1883); and Necrology from the Bulletin Almanac (1923-1966). Other newspaper indexes may be available by searching in our online catalog. Aside from these indexes, many newspapers are available in original or microform format. HSP also offers visitors to our library free access to NewsBank's database, "Pennsylvania's Historical Newspapers," which includes primarily 18th- and 19th-century newspapers. HSP members at the Patron Plus ($250) level and above also receive a free subscription to GenealogyBank.com, one of the largest online newspaper archives for family history research. The Genealogical Society of Pennsylvania maintains a list of Philadelphia-area repositories, including a summary of which vital records can be found where. Follow this link for the Philadelphia County resource page; the list of repositories is available under "Research Resources." In addition, our Hidden Collections Initiative for Pennsylvania Small Archival Repositories (HCI-PSAR) reveals the often hidden archival collections held by many small, primarily volunteer-run historical organizations in the Philadelphia area. Follow this link to explore HSP's regional directory of small repositories; finding aids for those collections are available on the Philadelphia Area Consortium of Special Collections Libraries (PACSCL) finding aid website.